The more Dezel talks to people about Virginia and East Coast wines the more Dezel realizes that most people are only familiar with the more common Bordeaux red wine grape varieties - Merlot and Cabernet Sauvignon. I will be the first to say that those two grape varieties make excellent wines, hence their popularity. However, on the East Coast Cabernet Franc is the more consistent and reliable selection for growers out of the bunch. Therefore, Dezel is putting Cabernet Franc on center stage and recommending a few selections that I have enjoyed. If you have any Cabernet Franc recommendations for me, feel free to drop me an email or leave a comment. Well friends – Lights, Camera, Action! Let’s talk about your local red wine alternative: Cabernet Franc! Cabernet Franc is a classic European red wine grape variety that is primarily used for blending in French Bordeaux. In the Loire Valley (Chinon), Cabernet Franc has been grown for centuries and regarded as a fruity, smooth, and soft everyday village wine. Unlike desirable grape varieties such as Merlot and Cabernet Sauvignon, Cabernet Franc thrives in cooler climates and ripens fairly early which explains why this grape is a popular selection for Virginia and other East Coast growers. At its best, Cabernet Franc offers a signature violet and raspberry bouquet with pleasant red fruit-filled flavors, hints of black pepper, and spice with mild nuances of fresh herbs. Compared to Cabernet Sauvignon, Cabernet Franc lacks the fullness, body, acidity, and tannins, and is usually approachable young, but can also age well pending style. Where Cabernet Sauvignon can be described as King of the European Reds, Cabernet Franc is the tasteful Prince who has won over many a Virginian palate. Grab a Cabernet Franc friends! In Virginia, you will find that Cabernet Franc is being made in a wide range of styles. This variance can be attributed to the quality of the harvested fruit, winemaking technique, and what may or may not be blended with the Cabernet Franc. One thing is for sure, however; Virginia is producing some good to great Cabernet Francs. As a matter of fact, many locals in and out of the industry hail Cabernet Franc as the states flagship red wine, with Petit Verdot and Norton to follow. Pending style, Cabernet Franc can be served with a little chill (fruit forward style) or at room temperature. Most Cabernet Francs are food friendly and can be paired with foods such as poultry, turkey, pizza, lasagna, roasted lamb and braised veal, and sips nicely on its own. The pinnacle of Cabernet Franc's success can not only be found in Virginia, but in Saint-Émilion, where Cabernet Franc holds noble court. Cabernet Franc is the primary grape used in Cheval Blanc, and these sought after elegantly structured wines of Château Cheval Blanc can fetch a pretty penny. Try one if you get a chance! 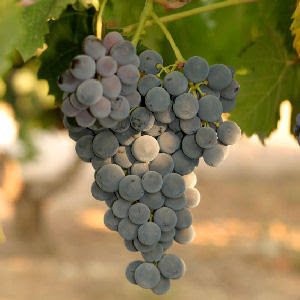 Cabernet Franc has also been linked as one of Cabernet Sauvignon's parent grapes (crossed with Sauvignon Blanc). Although not as big, or bold, as child, Cabernet Franc overwhelms in expression and attracts the palates of many. Horton Vineyards 2000 Cabernet Franc - My good friend Terry of Mondosapore wine blog just reviewed this wine; check it out! Waterford Vineyards 2002 Cabernet Franc – Has aged nicely, complex and elegant. A must buy if still available. Waterford Vineyards 2005 Cabernet Franc – Young and solid, opens up nicely, top rated 05 VA Vintage. Rappahannock Cellars 2005 Cabernet Franc – Nice red fruit flavors, soft tannins, drinking nicely now. Doukenie Winery 2004 Cabernet Franc – Nice integration of soft fruit, herb and spices. Pearmund Cellars 2003 Cabernet Franc – Dark cherry flavors, mild herb, aging nicely. Winery at La Grange 2005 Cabernet Franc – Subtle fruit, spicy, peppery, soft herb notes. Tarara Winery 2003 Cabernet Franc Reserve – dark cherry, spice, with a pinch of pepper, supple tannins. Veritas 2004 Cabernet Franc – easy drinking, soft, fruit forward style. Breaux 2002 Lafayette - Cabernet Franc based wine; soft red fruit, spicy and peppery - a Cajun delight! And for the sweet ending friends! Try the Kings Family Late Harvest Cabernet Franc 2005 dessert wine – Lovely, slightly sweet, with dark cherry and cocoa notes. Yummy! Also, Dezel recommends a trip to the wine store (Total Wine, Unwined, etc.) and trying the Loire Valley (Chinon) Cabernet Franc examples. These varietal wines range from $10 - $14 and have never disappointed me. You will not find Cabernet Franc on the label, but you will find Chinon, one of the few villages of the Loire Valley that focuses on red wines. Buy with confidence and enjoy! Expect a fruit forward, pure / clean and easy drinking example. Yummy! Great quality to price ratio. In closing, the next time you treat yourself, Dezel recommend this hedonistic pleasure wine - Inniskillin Cabernet Franc Ice Wine from the Niagara Peninsula, Canada. This wine is a tad pricey ($85), but worth every rich and flavorful drop and penny. And you will want to savor each drop, because, like most dessert wines this one comes in a ½ bottle (375ml). This wine is vibrant and rich with inviting aromas and intense flavors of baked apple, red berry fruit, balanced by refreshing acidity. The only warning I have for you is that it can be addicting!